You know not all of my recipes are something that I came up with because Of a craving. Sometimes they come about based on the weather that week or the previous week. Sometimes they come about because of a viewer’s suggestion or particular question. Sometimes they don’t come to me at all and I have to reach out to my “Recipe Idea Muse” for inspiration. But this week, this week falls under the I WANT THIS category. Strawberry Cake along with Strawberry Shortcake or strawberry anything really, is the quintessential taste of summer that I crave where desserts are concerned… especially, special occasions like... oh, sayyyy...my upcoming birthday this Saturday! Now, I’ll be in New York City for the weekend, so if any of you decide to knock out a strawberry cake, you know for a special chef in your life, I would be happy to accept that cake when I return. It doesn't necessarily have to be this recipe, but please go ahead and use this one as your catalyst or inspiration. With that said, enjoy this easy “All In One” strawberry cake utilizing the freshest most vibrant strawberries of the season. Of course when strawberries aren’t at their peak, like in the winter months, and you are craving strawberry cake… whole frozen berries are your next best option. All In One...all in one bowl! Preheat your oven to 325 degrees. Prepare three 9” round cake pans with butter and flour, or baking spray. Line the bottom of each pan with parchment paper. 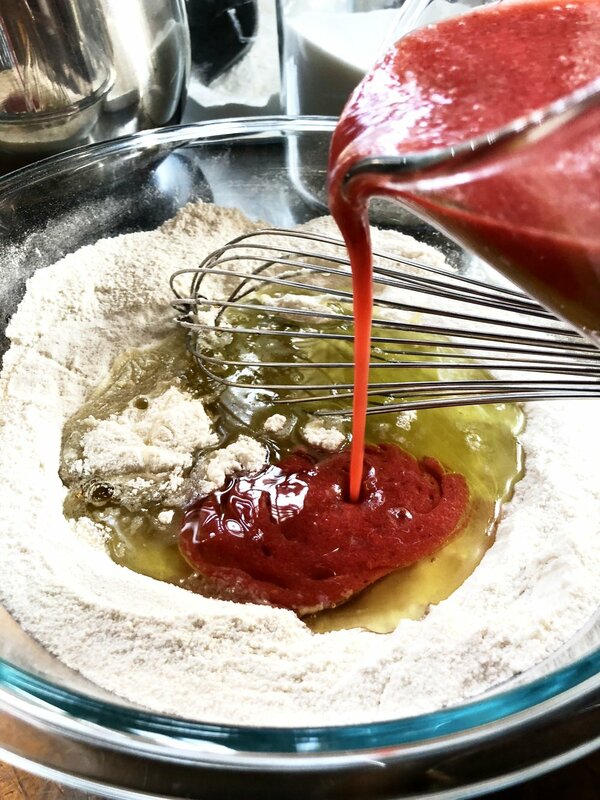 In a mixing bowl of your stand mixer with a paddle attachment, or you may use a bowl and spoon… combine the flour, sugar, baking powder, lemon zest, and salt. Give it all a good stir a few times to combine all the dry ingredients well and evenly. To the dry mixture add the beaten eggs, grapeseed oil, and 2 cups strawberry puree. Slowly mix into a nice smooth cake batter. Scape down the sides and bottom with a rubber spatula, then give it all another mix. Divide the cake into three equal portions and add to the three prepared round cake pans. Place the pans in the oven and bake for 30 minutes until your cake tester (however it is you check a cake) dews out clean. In a mixing bowl with paddle attachment start to cream your butter until it is light and fluffy. Add the mascarpone cheese and whip in until light and fluffy. Scape down the bottom and sides then add the vanilla and salt. Give it another good paddle whip with the mixer. Alternating the powdered sugar and strawberry puree… starting with the powdered sugar… mix in a little of each at a time. Start with half powdered sugar and mix that in. Add the 1/2 cup pureed strawberry and mix in, ending with the last half of the powdered sugar. Once again scrape down the bottom and sides, add the tablespoon of heavy cream, and give the frosting another good mix. Frost each layer evenly, adding fresh sliced strawberries if you like (I like!). Finish by icing the top and sides as you please. Enjoy this delicious and sweet bite of summer!